Rosemary is one of my favorite winter-time herbs. With the cold weather and low light levels of the winter months, very few herbs will grow here, inside or out. Although I long for a full kitchen herb garden that provides fresh herbs all year long (perhaps with the aid of a grow light) for now I have to be content with what will survive in front of a sunny window. 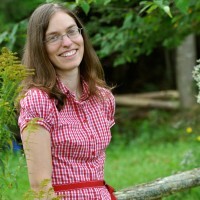 This is the first post in a new series: Spotlight on Herbs. My current rosemary bush is two years old, about 3 feet tall, and happily lives in a large pot on our deck all summer, and in front of our sunniest window all winter. I have never been a big fan of dried rosemary, but picked fresh it is beautifully fragrant and a wonderful addition to so many dishes. Like many perennial herbs, Rosemary can be grown from seed, but it takes a lot of patience to wait for it to reach a good size for harvesting (2 to 3 years!) For this reason I have always purchased my rosemary plants as seedlings. If you are lucky enough to live in zones 8 to 9, you can enjoy rosemary fresh from your garden all year round. Otherwise, it is best planted in a large pot, set in a sunny location during the warm months, and over-wintered indoors. It can be a bit finicky to successfully transition a Rosemary plant to growing indoors, as they are very prone to suddenly dropping all their leaves and dying on the spot, but there is a wonderful explanation of how to successfully move a rosemary plant indoors here. Rosemary requires good potting soil, a well-draining pot, and should be watered well when dry. 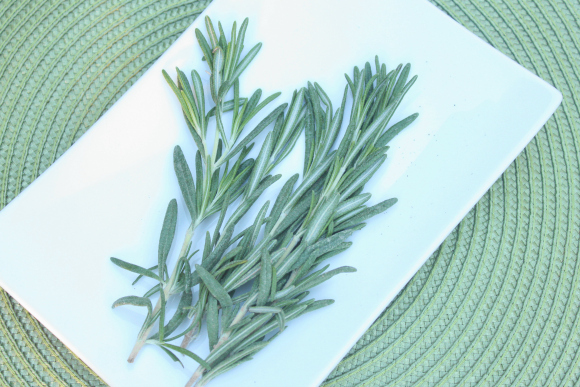 Rosemary is reportedly good for the brain; improving concentration and helping to relieve headaches and migraines. 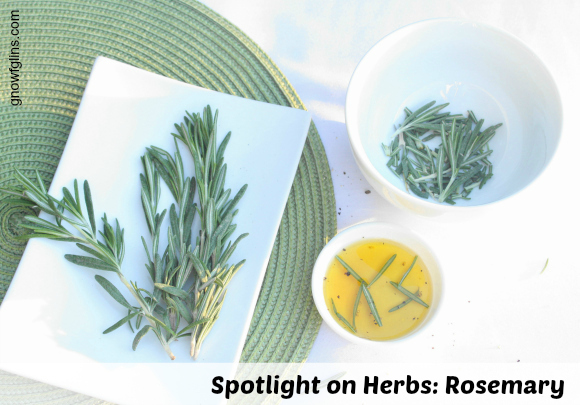 In addition, Rosemary stimulates circulation, and is often included in beauty products such as hair rinses, soaps, and creams. It is easy to enjoy the benefits of rosemary by pouring boiling water over a few sprigs and enjoying a cup of Rosemary tea. 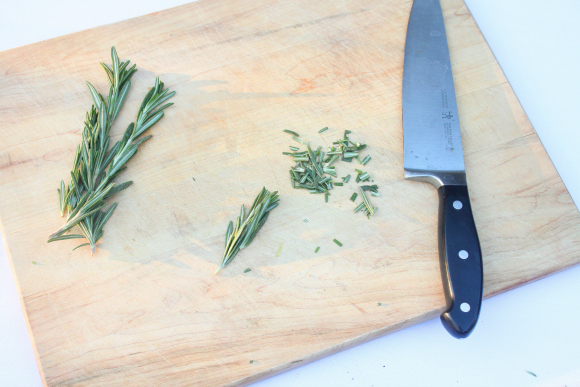 There are so many ways to make use of Rosemary in the kitchen. It can be chopped up and added to just about any dish, including soups, stews, sauces, gravies, eggs, vegetable dishes and casseroles. It is also a wonderful addition to homemade breads, biscuits and pitas. I always tuck a few sprigs inside a chicken before roasting, usually along with lemon, onion, or bay leaf. Whole sprigs can be frozen in glass jars in the freezer and removed as needed for fresh flavor at any time of year. Do you grow Rosemary in your garden? What are your favorite ways to use this versatile herb? I made a rosemary salt this year that I love! I live in South Louisiana and love gardening. I have been growing Rosemary a a spring in my pillow helps me breathe better at night because of my asthma. I wonder if I can pick some and remove the leaves and chop and dry in the oven. I have been doing that with onion tops and it is so good in eggs, soup etc. Thank you for this article. On top of breathing better, I bet it’s wonderful to smell that lovely Rosemary scent each night! You can definitely dry it in the oven. Some say it’s actually the best way of drying Rosemary. I love rosemary! I started growing some this past summer. I have one plant still outside and brought one indoors. SO far so good. I love mixing rosemary with balsamic vinegar, olive oil and some Montreal steak seasoning to make a quick marinade for chicken. Yum! I will have to try that marinade. Thanks for posting! I use fresh rosemary not only in roasted chicken, but in homemade spaghetti sauce, soup, and chicken stock. For Thanksgiving, I made a compound butter for under the skin of the bird, and finely chopped rosemary was a key ingredient, along with basil, sage, marjoram and garlic. I never thought to throw some in chicken stock – I am going to try that today! Your compound butter sounds delicious, too. thanx for the article, andrea. i love planting, cooking & eating. i live in the philippines. i love my rosemary. i smell them every morning. i love to rub my beef with rosemary before roasting! more articles, please!